Ochazuke is one of the most traditional and basic dishes found in Japanese cuisine. It combines two of the most fundamental Japanese ingredients, rice, and tea. 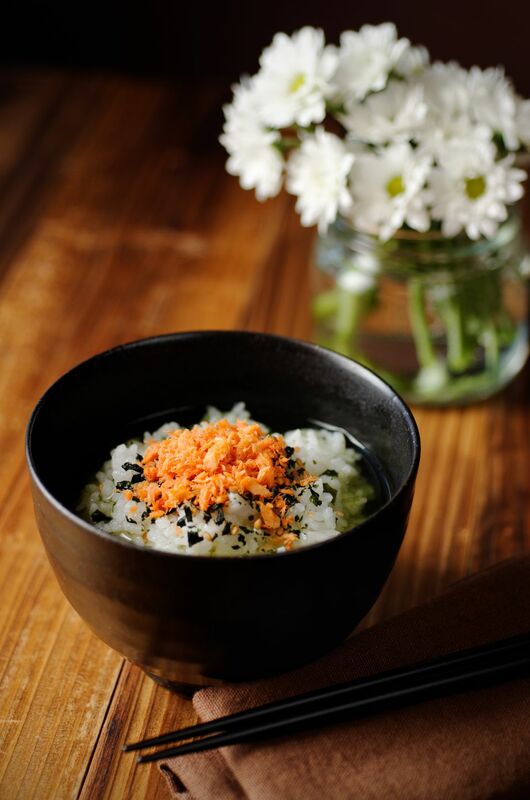 Essentially, ochazuke is a small bowl of steamed short-grain rice with hot brewed tea poured over it. While ochazuke may simply be enjoyed with rice and tea, it is often served with any number of toppings (seafood, meats, vegetables, pickles, seaweed, and other Japanese ingredients). According to Western cuisine, this dish may be considered a type of soup; however, in Japanese cuisine, it is a rustic dish unto itself and is neither soup nor stew. In the home, ochazuke is known as comfort food. It is typically enjoyed as a filler snack, any time of the day, but it is especially loved as a midnight snack, or as a hangover remedy. It is traditionally enjoyed as a dish at the end of a Japanese meal, either to finish up a few last bites of rice or when your stomach feels like it needs just a bit more to feel full, this mild-flavored dish is perfect for ending a Japanese meal. Don’t be deceived, however, because ochazuke can also be eaten as a meal in itself for breakfast, lunch, or dinner. Home-cooked ochazuke ​is typically made from leftover rice (either short-grain white rice or brown rice), leftover ingredients such as cooked fish, pickles, and a variety of salted dishes known in Japanese as tsukudani, and tea (typically green tea or other mild, non-black tea). Prepackaged individual servings of dried ochazuke seasonings are widely sold in both Japanese and Asian grocery stores and are quite popular. These seasoning packets are merely added to cooked rice and either hot water or tea is poured over it to make instant ochazuke. In restaurants, ochazuke is served in either a fine dining multi-course meal where it is served at the end of the course, or it can be served at a bar or izakaya (tapas style restaurant) restaurant or cafe as a side dish or entree. In the latter, ochazuke often follows alcoholic drinks by signaling the end of the evening, and it's also considered a good way to fill up your stomach before heading home. When ochazuke is served as the last course to a meal, the rice, and various ingredient toppings may be served in a broth that is made from dashi (stock), with a more complex flavor profile, or tea. Select the appropriate size bowl for your snack or meal. Typically, a small Japanese rice bowl is used, but for a meal, a larger bowl might be appropriate. Add enough rice (short-grain white or brown rice, or barley) to your bowl to satisfy your needs. Make sure your rice is warm, especially when using leftover rice. Reheat it in the microwave as needed. Select your tea: green tea (sencha), hoji-cha (roasted green tea), or genmai-cha (roasted brown rice tea). Green tea is the most typical type of tea that is used for ochazuke. Alternatively, use hot boiled water. Black teas are not traditionally used to make ochazuke as the flavor of the tea is too overpowering, and ochazuke is considered a mild-flavored dish. Or, instead of tea, make a simple dashi broth. Pour this over the rice instead. For a simpler ochazuke, pour hot boiled water all over your rice and garnishes. Enjoy! Alternatively, make an instant bowl of ochazuke if you are in a hurry or do not have any topping ingredients. Use a prepackaged dried seasoning packet; flavors include salmon, cod roe, wasabi (horseradish), umeboshi (pickled plum), nori (seaweed), wakame (kelp). Mix seasoning with rice and boiled water or brewed Japanese tea.